Alexia Sweet Potato Fries Deal + FREE Ketchup! Head over to Coupons.com to print out this new Alexia sweet potato coupon. You can use it at Target to score free ketchup while saving on sweet potato fries! = $4.88 for the 3 products after coupons and deal! This deal is valid until 4/28, so you have plenty of time to get it, but definitely print this coupon now because they usually disappear quick! 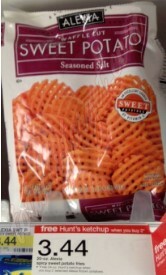 Or if you'd rather, you can use it at Walmart where there have been lots of reports saying that Alexia Sweet Potato Fries are on Rollback priced at $2.98...so, $1.98 after coupon. Thanks, Totally Target & I Heart the Mart!